Just as in George Orwell’s 1984, “opponents of the working class” in China not only disappear physically, never to be heard from again, but also historically. A case in point are the two photographs printed here which demonstrate one of the most cynical ways to re-write history: the use of doctored photos. The first, taken from the 20 September 1976 Hsinhua Weekly, shows a mass memorial meeting for Mao Tse-tung with an unbroken line of assembled bureaucrats in attendance. 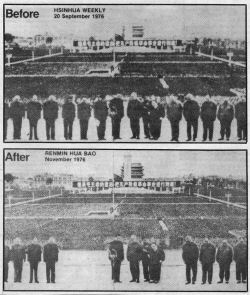 In the second shot, from the November 1976 Renmin Hua Bao, the same scene is presented but with the members of the so-called “Gang of Four” removed and replaced with shrubbery. Although we consider this a gross slander against the plant world, we would support all politicians being turned into bushes. But that aside, this act of making political opponents within the ruling bureaucracy into “non-persons” has a long history in the Leninist movement. In the Soviet Union, Stalin would order offending pages or paragraphs excised from history books every time the party line changed or another party leader was executed. Similarly in China, upon the re-printing of Quotations from Chairman Mao (the Red Book), all references to Lui Shao-chi have been removed as has the introduction by Lin Piao. These same photos recently appeared in a Trotskyist publication, Workers Vanguard (sic), which crowed grandly about what they call the “Stalin School of Falsification,” since the two-bit politician they revere was subjected to the above mentioned process. This is blatant hypocrisy, since Trotskyism is nothing but Stalinism out of power. When Leon Trotsky had the authority and power of the Soviet State behind him, he was as ruthless and authoritarian toward revolutionary workers and peasants in the Soviet Union following the Russian Revolution as was his more successful competitor, Stalin. Further, no different from their Stalinist cousins, the Trotskyists continue every Leninist slander and lie against the workers’ movement to justify its annihilation by the Bolsheviks. They only groan when their ox is being gored.